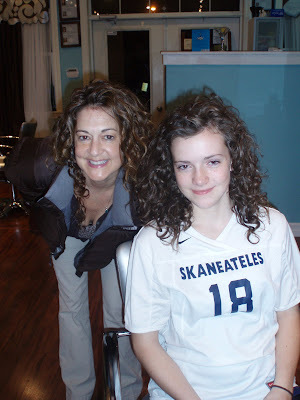 Bijou - A gem of a little salon in Skaneateles: Deva curl in Skaneateles! I heard about Deva curl last year, and gave it to my curly haired friend, who tries out curly haired products for me...Last year, she vetoed it! Did not like it...at.all! 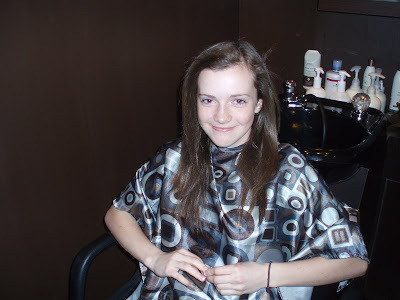 I told another salon owner in NJ who sells it and she was shocked, she thought we must have not used it correctly! I put the product away and searched for more curly haired solutions. Over Christmas we got the "curly girl book", written by...of course the owner of Deva curl. We sold so many books, but still not had much luck with the product! Then the Deva curl class came to Syracuse, Michele and Courtney attended the class and they were WOWWED! I ordered the complete line and was willing to try it, once again. Courtney and Michele are dying to do a cut they learned, specifically for curly hair, so if you are game, give one of them a call! Okay so back to my story...Tonight my last person, my curly hair friend, let me use the stuff and do it how Michele and Courtney learned, and let me tell you...I'm wowed! Normally Jaime's curls are not at all defined or bouncy...with about 10 pins, and them simply put in, she had wow hair! I could not believe it! So we are all jazzed up about the Deva curl, it's awesome if you have curly hair, let us show you how to actually work it and do it, really, it's so simple, easier than anything! Check out Jaime and Taylor....I should have gotten a picture of the before for Jaime, that would have been impressive, but Taylor was a pretty good sport...she's a teen who is used to wearing it super straight... This is with absolutely no curling iron and not a bit of work from me!! I think it's magic!